Each design represents a tree at different times of the year. Perfect on their own but great as a collection! Choose from Spring, Summer, Autumn and Winter. Lovingly hand crafted by glass artists each individual piece is a beautiful work of art. The highest quality glassware in original designs in vibrant colours. Collect all four trees and capture the beauty of all the seasons in your home. Perfect gift for garden lovers, anniversaries, birthdays, leaving presents and weddings. Each item is boxed and supplied with a label. 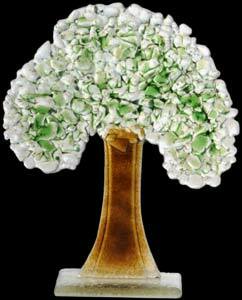 Introducing the Fused Glass Summer Tree from the Four Seasons Fused Glass Collection by D & J Glassware.